ANZAED offers members three scholarships for conference registration for our Annual Conference; the Peter Beumont ANZAED Young Investigator Prize and the Paul Foulkes ANZAED Clinician Scholarship. The AED/ANZAED Travel Scholarship supports young investigators presenting their research on the international stage at the AED conference. The annual Paul Foulkes ANZAED Clinician Scholarship is a prize for a clinician who is a member of ANZAED and who can demonstrate that their attendance at the ANZAED conference will be of substantial benefit to the clinician, his/her organization, his/her clients and the community at large. Any clinician working in the eating disorder field who is a member of ANZAED is eligible to apply for this scholarship. The Executive Committee will select the applicant it believes best fulfils these criteria. The prize will be exemption from conference registration and $AU500. The 2018 award winner is Elesa Crowley from Tamworth Rural Hospital. 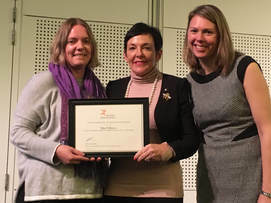 She is pictured here receiving her award from ANZAED President Gabbi Heruc and ANZAED Patron Kate Carnell. Please visit the conference website to apply for a 2019 scholarship. Applications close 14 May, 2019. Results notified by 13 June, 2019. Two scholarships are available for clinicians working in rural & regional settings to attend the annual conference. The prize is exemption from conference registration. Applicants must be a clinician working in the eating disorder field who is a member of ANZAED. The ANZAED Executive Committee will select the applicant it believes best fulfils these criteria. Provide a reference in support of the application from the organization in which he/she works or a professional who is aware of the clinicians work. The 2018 award winners were Melissa Holland from Mildura Base Hospital (pictured below in left photo) and Katie Babbott from Youth Horizons Trust (pictured below in right photo). Please visit the conference website to apply for a 2019 scholarship. Applications close 14 May, 2019. Results notified by 13 June, 2019. 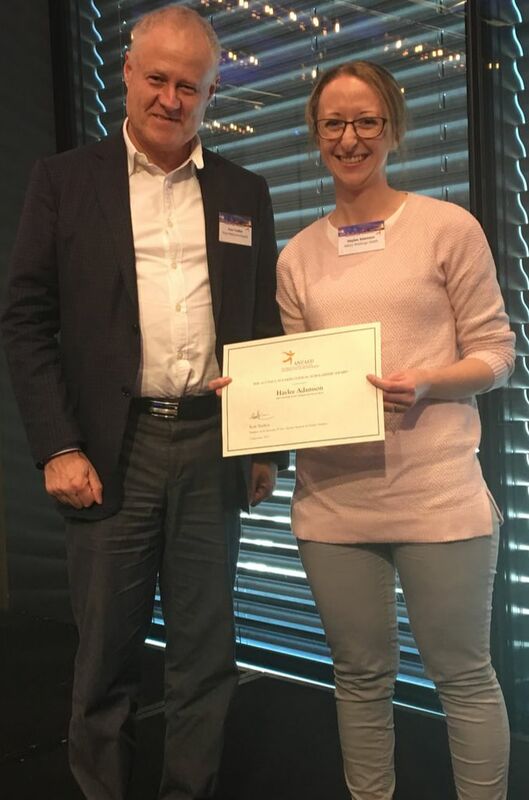 The Peter Beumont ANZAED Young Investigator Prize is awarded to a young investigator from a germane discipline who is a member of ANZAED and has submitted the abstract to the ANZAED conference which is deemed to be the best by a selection committee. The prize will be the conference registration (applicants must register to the conference but this will be refunded) and a $500 honorarium. His/her paper will be adjudicated at the conference; the winner will then have the conference registration reimbursed and be paid the honorarium. The 2018 award winner was Mia Pellizzer. 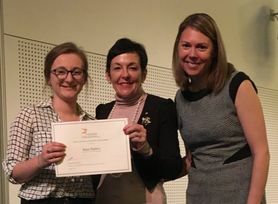 Dietitians Association of Australia (DAA) research prize for the best Dietetic research presentation encourages and recognises excellence in the area of Dietetics in the field of eating disorders. 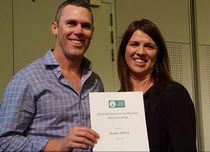 The award is for the best Dietetic research presentation at the Australian and New Zealand Academy for Eating Disorders Conference. 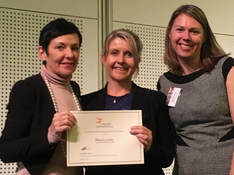 All Accredited Practising Dietitians who present a short oral paper, workshop or poster at the ANZAED conference will be eligible for the award. The successful candidate for the Award will be announced at the conference and will receive an award of $300 and a certificate. The winner will be featured on the ANZAED website and in the Dietitians Association of Australia newsletter. 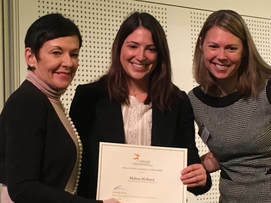 This award is for young investigators who have an Abstract accepted at the annual International Conference on Eating Disorders (ICED), run by the international Academy of Eating Disorders (AED) Two scholarships are available. Each includes registration for the AED Conference and pre-conference research workshop, plus $AU2,000 in travel costs for first prize, and $1,000 in travel costs for second prize. 2019: Nora Trompeter for The mediating effect of Emotion Dysregulation between Gender Typicality/Contentedness and Drive for Muscularity and Cross-sectional and longitudinal associations between fear of negative evaluation and weight/shape concerns among adolescents. 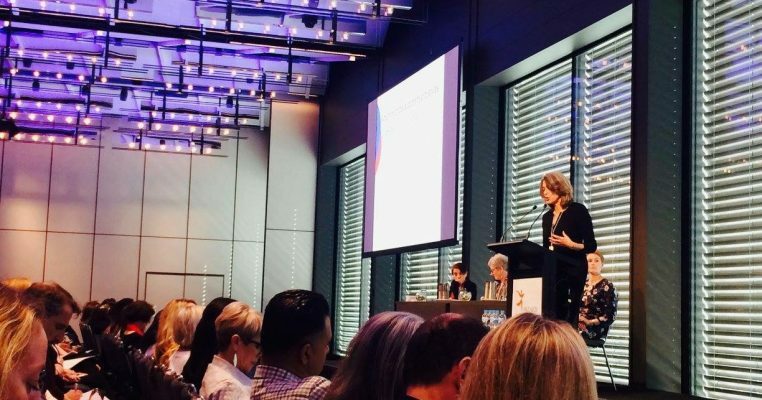 2014: Lisa Dawson for Defining Recovery from Anorexia Nervosa: Can we Reach Consensus? 2013: Siew Soon for Testing of a Metacognitive Control-Related Maintenance Model of Anorexia Nervosa.